When can I apply? How much does it cost? Can I skip the test if …? Do I have to give up my birth country nationality? 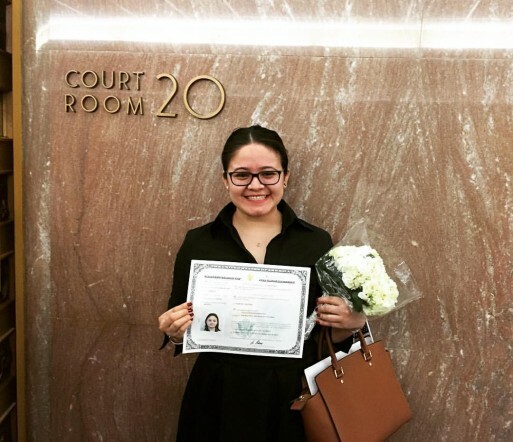 These were some of the questions I had about becoming a U.S. citizen for a long time, which if not answered professionally, could lead to a very long path. This is essentially what happened to me and why I delayed the process of becoming a U.S. citizen. Unlike many of our clients, I was privileged to enter the country as a Lawful Permanent Resident (LPR or with a “green card”); therefore many can say that “I had it easy.” But, for many of my early years, I was unaware of the benefits of my status and lived and worked among undocumented people, observing how they lived in fear of being fired, abused, detained and removed. Later I learned that a green card is only partial protection from deportation. Did you know that even if you have a green card, you are not guaranteed to stay in the U.S.? Working at Benach Collopy made me realize this. I’ve become familiar with cases were LPR parents faced the risk of being taken away from their family, houses and a lifetime of memories, because they made a mistake. Others came from countries where the government’s corruption would not allow then to have a voice; and while the United States is a country with freedom of expression, it’s not until after becoming a U.S. citizen, when you can fully participate in the country’s democracy. In my opinion, you can’t really call this country home, until you become a citizen. 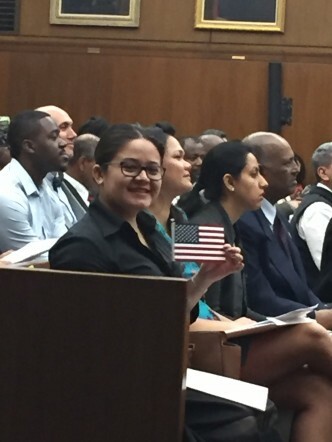 For us immigrants, U.S. citizenship is not an innate quality; it requires the development of critical skills, knowledge base, a system of values, insights and understanding. Citizenship has to be both taught and learned, however its benefits are immeasurable, if you take advantage of its benefits by voting and otherwise participating in the political arena. Citizenship allows us to bring our country together for a common purpose, healing the divisions in society by electing better officials to represent us. It eliminates the possibility of deportation– it doesn’t just happen to undocumented immigrants and it doesn’t even have to be a very serious offense. Permanent Residents don’t have as many options to take a plea bargain or do jail time or community service because of the threat of deportation. Holders of a United States passport can travel to 174 countries and territories visa-free or with visa on arrival. Also you can travel for as long as you want with no restrictions! But, what I consider one of the most important “perks” of becoming a U.S. Citizen; is to be able to sponsor your family to obtain legal status in this great nation. Naya after becoming a U.S. citizen. I’m happy to say the United States is home, I can finally plant a tree and know that I will be here to see its fruits.